Director/Screenplay – Osgood Perkins, Producers – Bryan Bertino, Adrienne Biddle, Alphonse Ghossein, Robert Menzies & Rob Paris, Photography – Julie Kirkwood, Music – Elvis Perkins, Visual Effects – Eggplant Pictures, Special Effects – Practical Cineffects (Supervisor – Dean Robinson), Makeup & Creature Effects – Form & Dynamics (Supervisor – David Scott), Production Design – Shane Boucher & Lisa Soper. Production Company – Unbroken Pictures/Paris Film, Inc./Zed Filmworks/Go Insane Films/Traveling Picture Show Company/120db Films. It is the end of term at the Bramford Catholic girls’ boarding college. Rose and Kat are left behind when all the others depart. Kat has not heard from her parents who are supposed to come and get her, while Rose has made a mistake in telling them which day to arrive. As the two girls remain behind in the school, Rose sees disturbing things starting to happen. Meanwhile, Joan, an escapee from a psychiatric institution, makes her way across country. She is offered a ride and help by Bill who is travelling to Bramford with his wife Linda. This was the first feature from Osgood Perkins, sometimes also credited as Oz Perkins, who is promising to be a major genre director. Osgood’s father was none other than Anthony Perkins, famous for the role of Norman Bates in Alfred Hitchcock’s Psycho (1960). Osgood had a minor career as an actor – he first appeared on screen as a young Norman Bates in Psycho II (1983) and has small roles in everything from Six Degrees of Separation (1993), Wolf (1994), Legally Blonde (2001), Secretary (2002), Dead and Breakfast (2004) to Star Trek (2009). Osgood has also written the scripts for the thriller Cold Comes the Night (2013) and the horror films Removal (2010) and The Girl in the Photographs (2015). He subsequently went on to direct the ghost story I Am the Pretty Thing That Lives in the House (2016). Osgood’s younger brother Elvis Perkins is also responsible for the film’s score. This film is known under a variety of titles – February, The Devil’s Daughter. It gets called The Blackcoat’s Daughter most often because that it what it was renamed in US release, or else February because that would appear to be its original title and it is listed as such at the IMDB. The thing about these two titles is that neither of them are that relevant to the story. We see a calendar in one shot and realise that the school scenes are taking place in the month of February but that is the sole relevance the month in the title has. Quite what the ‘blackcoat’s daughter’ means is a puzzle. Blackcoat is an archaic term for a clergyman but unless you want to include some obscure reference to one of the Catholic priests, neither of whom are mentioned as having daughters, this does not seem applicable. The only other connection one can think of is that James Remar, who plays Lucy Boynton’s father, wears a black coat. Osgood Perkins is a master of the slow film. His set-ups are not those of easy jumps or formula filler. Rather he drinks in small detail, allows things to take place in slow, seemingly irrelevant movements, and then jolts us out of our nonchalance by a wild and outre image. The other notable aspect of Osgood’s films is their wilful crypticism. As you are watching the stories of the three girls play out, it only gradually starts to become apparent that we are not watching a storyline that occurs concurrently but one that is flipping back and forward across different periods of time. And then comes the jolt twist [PLOT SPOILERS] where James Remar reveals the photo of his dead daughter and it is none other than Lucy Boynton who we have been following as one of the central three girls. Where the film becomes confused is at the ending [PLOT SPOILERS] where it becomes apparent that Kiernan Shipka killed everybody at the school in the past, while Emma Roberts travels to the school several years ahead in the present and slaughters James Remar and Lauren Holly before going off into the abandoned school. I have read articles on this – here’s one at The Blackcoat’s Daughter Ending Explained at Creators.co – that offer the theory that Emma Roberts is the grown-up version of Kiernan Shipka. I am not sure if I believe that one – wouldn’t the parents recognise her face as one that would be splashed all over the news? To me, the film is more a possession story, of which we get clear evidence. 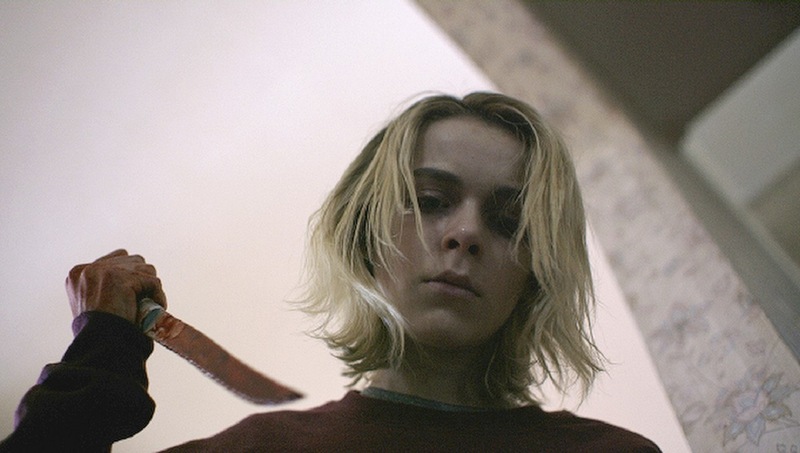 There is a scene at the asylum where Kiernan Shipka relinquishes the entity after the priest performs an exorcism so it would seem evident that she is no longer possessed. Is it not too difficult to imagine that Emma Roberts was another patient at the hospital who then became possessed by the entity and escaped.